If you want to learn your favorite songs, but haven’t yet learned how to read music, don’t worry! Many music books are available that contain tablature, or “tabs.” These make it easy to learn leads and bass lines. There are tab books available for many different instruments. This article concentrates on tabs for guitar and bass guitar. Using standard guitar tuning, this represents the diatonic C scale (“do re mi…”). To properly picture this, imagine the guitar in playing position. The bottom line of the tab represents the sixth or low E, string. The second to bottom line represents the fifth (A) string, the next line is the D fourth string, and so on (G, B, and high E, respectively). 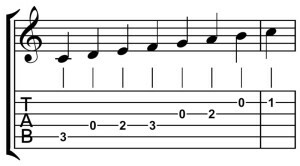 The numbers on each line represent the fret where the finger should be placed. 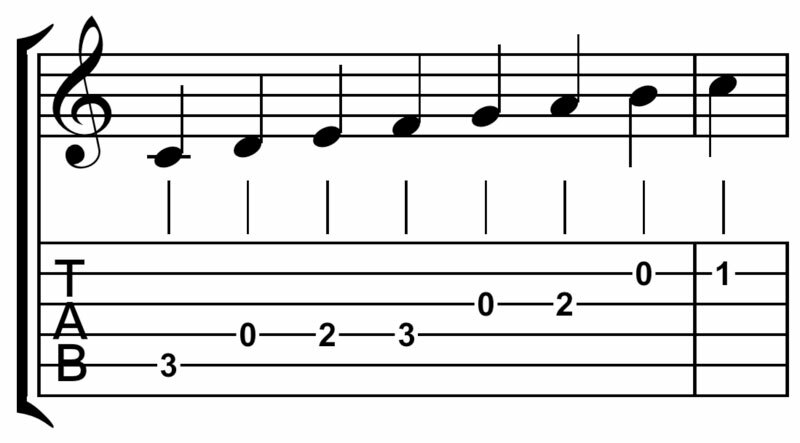 In this example, the C note is played by placing your finger on the third fret of the fifth, or A string. The D note is represented by playing the fourth or D string open, E by placing your finger on the second fret of the same string, and so on. Keep in mind that bass tablature typically has 4 strings represented instead of 6, as most basses used are the 4-string variety. As you can see, this is a relatively straightforward and simple way to represent music notation. Tablature has several advantages over standard notation. It gives you a decent visual representation of the fretboard. It gives you accurate finger positioning. Another advantage you may not be aware of is that tabs can be accurately (if crudely) typed out on a computer in basic typewriter font. If you analyze tablature, over time you may be able to correlate the placement with the note. This may help speed up your learning of standard notation, if you wish to do so. Tablature has some distinct disadvantages as well. It does not indicate pitch. It is instrument-specific, as opposed to general notation. There is little or no indication of any particular rhythm or tempo. If you are playing with other instruments, you won’t be able to gauge your exact place with the other instruments based solely on tablature. You really have to listen, or already be quite familiar with the song. So when should you use tabs? They are a great way to begin learning your instrument. It is a decent short cut if you are trying to learn a particular song quickly. If, however, you are looking to progress, or especially if you want to learn a particular song on more than one instrument, at some point you may want to take the next step and learn general notation. Your local music shop will typically have quite a few sheet music books available. You may be surprised how many of your favorite songs are available in tab form. Magazines such as Guitar World and Bass Player also have monthly articles including tablature. Check them out!